Chandré Gould is a senior research fellow in the Crime and Justice Division of the Institute for Security Studies (ISS) and editor of the peer-reviewed journal South African Crime Quarterly. Chandré has a DPhil (History) from Rhodes University, South Africa and is an honorary research associate at the University of Exeter and at the Durban University of Technology. Between 1996 and 1999 she was an investigator and evidence analyst for the Truth and Reconciliation Commission, where she was involved in the investigation of Project Coast - the chemical and biological weapons programme of the apartheid government. 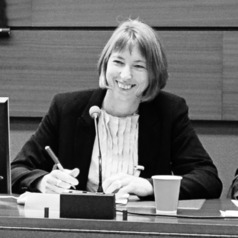 After 1999 she continued research into Project Coast and co-authored a monograph published by the United Nations Institute for Disarmament Research, and numerous papers and articles. She co-authored Secrets and Lies: Wouter Basson and the chemical and biological warfare programme (Zebra Press, 2002) about the trial of Dr Wouter Basson. She is a member of the Academy of Sciences of South Africa’s Standing Committee on Biosafety and Biosecurity, and a member of the panel that undertook a consensus study on biosafety and biosecurity in South Africa in 2013/14. Since 2006 her work has focused on violence prevention and criminal justice in South Africa. She has published several articles, papers and monographs on violence prevention and the criminal justice system in South Africa. Since 2008 she has been involved in a voluntary capacity, as CEO of a community-based organisation in Touwsranten (Western Cape). In 2009 Chandré edited a book on the criminal justice system in South Africa: Criminal (In)Justice: A civil society perspective. Her current work includes research with Dr Catherine Ward of the University of Cape Town on the role of parenting in reducing child maltreatment and aggression. Her latest monograph is Beaten Bad: the life histories of violent offenders.